The Texas MBA Program puts a nice balance of students into consulting, operations, brand and product management, and finance. I think that very positively mimics the work environments that they are going into where, irrespective of what function you have, you are going to be working with all different areas of the company. Your dedicated Texas MBA Career Management team provides a variety of career resources to ensure you land your dream job. Your first semester, you’ll take Strategic Career Planning , a class designed to identify and begin developing your professional goals. You’ll perform a self-assessment, practice interviewing techniques, build out your personal brand and social media networking strategies, and learn how to research career options. As part of of the MBA+ Leadership Program, you’ll have access to communication and specialty coaches—i.e., seasoned experts who are ready to work with you one-on-one to refine your skills in communication, leadership, strategy, organizational culture, and much more. Your career consultants are available throughout the year to provide professional guidance and insight. You’ll also pair up with a Peer Advisor—a second-year Texas MBA student who was at your stage of career planning just a year before. Almost 400 different employers participate in our recruiting events—networking receptions, career fairs, on-campus recruiting sessions, etc. 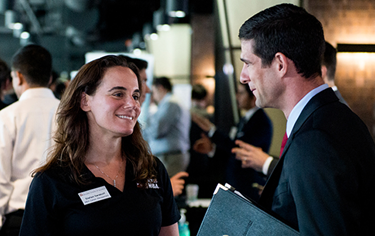 There are countless ways to meet your future employer while finishing your Texas MBA degree. Read more about our career treks in 2016-2017. In addition to Career Management services, Jon Brumley Texas Venture Labs provides unique entrepreneurial opportunities for MBAs through education and mentoring opportunities. The MBA+ Leadership Program is one of the highlights of the Texas MBA Program. In addition to career coaching, it offers hands-on experiences including Micro-Consulting Projects with outside companies, networking events, and industry seminars. The prestigious reputation of McCombs enhances these resources so you can be ambitious & clear about your career interests and connect with employers who sync up with all your goals– A big head start to your dream career! 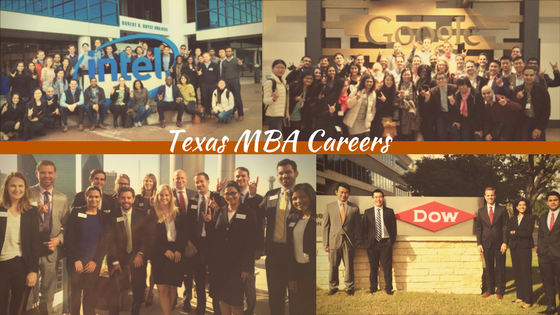 Learn more about Texas MBA Career Management, or contact us with any questions about becoming a Texas MBA.